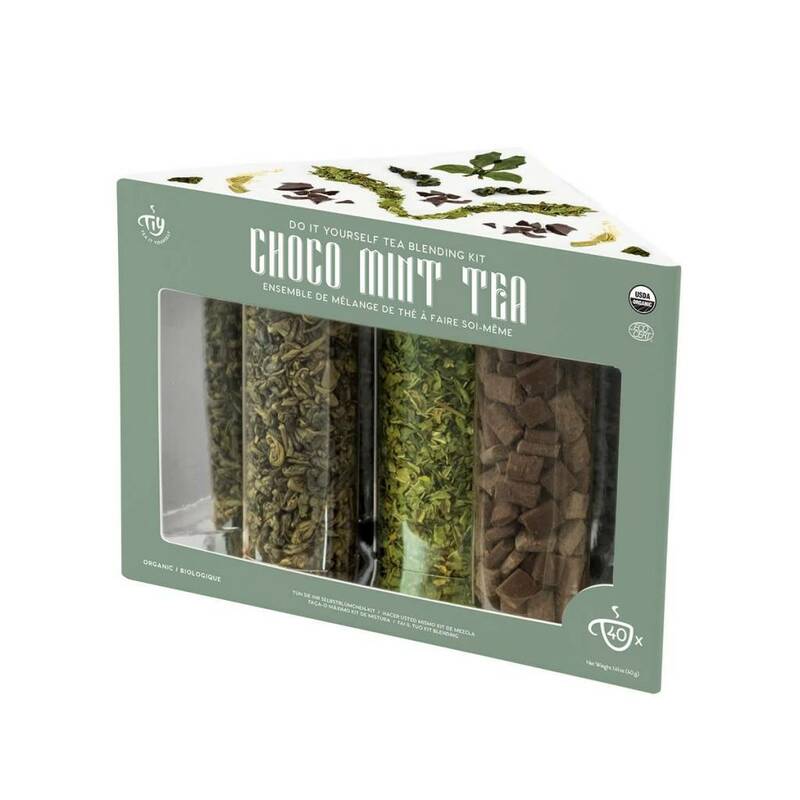 This tea kit contains Gunpowder Tea, an underrated well-rounded tea that provides the perfect foundation for a Choco Mint Tea. Spearmint lends its sweetness and freshness to balance out the richness of Dark Chocolate. These 3 Organic Premium Teas come in sleek, easy-to-store tubes that showcase the shapes and colors of these ingredients. 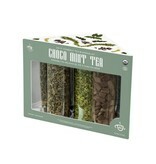 Enjoy them together, separate or in combination with other gems from your tea drawer. Combine the ingredients from your kit into your tea infuser. Place the infuser into your teacup, add boiling water, and steep for 3-4 minutes. Carefully remove your infuser and enjoy! Get started with a tasty Choco Mint Recipe or create your own custom blend! You can even enjoy the gunpowder, mint, and a touch of sugar on their own to make refreshing Moroccan Mint Tea. Similarly, don’t be afraid to try just the tea and chocolate together for a satisfying dessert. For a more minimalist drink, steep a simple cup of Gunpowder Tea. Gunpowder Tea* (0.67 oz) –Named for its unique appearance, gunpowder tea is rolled into pellets to preserve its freshness. This tea is native Zhejiang Province and has been around since the 6th century. It’s strong and bold in flavor –perfect for a cold rainy day! Spearmint* (0.35 oz) –This popular herb boosts memory and concentration while supporting digestion and boosting energy levels. Spearmint also gives you mint-fresh breath! Dark Chocolate* (1.41 oz) –Thanks to its complementary deep, rich flavor, dark chocolate provides just the right touch of sweetness in a Choco Mint Blend. At TIY, we focus on both proving high-quality natural ingredients and reducing our environmental impact. All of our teas are 100% organic and free of pesticides, preservatives, additives, sugar, and GMOs. You can safely enjoy every sip knowing that you’re drinking pure, traditional tea in an environmentally friendly, sustainable, and responsible way. What’s more, the cardboard packaging and tea tubes are recyclable. *MMTUM, Inc. Montréal (Quebec) Canada H2G 1Z3 Certified organic by Ecocert ICO according to NOP Standards as well as certified USDA Organic, Canada Organic, and EU Organic.